Jack O’Connor has said on a number of occasions that the “left” lacks ambition and courage. This is certainly true of the official trade union movement. It lacks ambition, courage, and vision. The movement has failed to articulate its own vision of society and how we might get there. It has failed to present consistently to its members and to workers generally the necessary short-term reforms and the medium to long-term transitional policies that will bring about socialism—a society by, for and of working people. And why is that? Many reasons, including the legacy of “partnership,” the “professionalisation” of the movement, the destruction of political education, the general depoliticisation of working people, the attitude of the media, confusion over the nature of the European Union, and more. Many of these problems will not be surmounted overnight; but one reason that stands out and that can be successfully challenged is the fact that the movement has essentially outsourced political policy to the Labour Party, and is reluctant to promote and campaign on a political programme outside of what the Labour Party will allow—and this despite the fact that the ICTU is allegedly politically neutral, and only a couple of unions are actually affiliated to the Labour Party. More than a hundred years ago the trade union movement decided it needed to fight on the political field as well as the industrial, and so it established the Labour Party as the political wing of the movement. The Labour Party was to represent the industrial organisation of the working class in the political structures of the day; and people like Tom Johnson—trade unionist, Labour Party leader, and main author of the Democratic Programme—did so. Now, however, the relationship has been reversed and the Labour Party is determining political policy, and unions have shied away from any independent vision or confrontation with Labour. The tail is clearly wagging the dog. There is no doubt the political landscape has changed dramatically over the last few years. Fianna Fáil has lost the support it had among sections of the working class. The Labour Party has lost its working-class base in cities and towns. An extremely right-wing ideological Fine Gael is the biggest party in the state electorally. And Sinn Féin has grown apace, capturing lost Fianna Fáil and Labour Party working-class support and middle-class frustrations. By far the most striking trend, however (and whether this will be so in the long term remains to be seen) is the electoral success of independents—largely progressive—and small left-wing parties. Whether we think the rise of independent TDs and councillors is good or not for working people is one thing, but there is no doubt it is a trend and will be a factor in the next election. But despite this massive change in electoral politics it is also clear that class rule remains as strong as ever, if not stronger. Successive governments of Fianna Fáil and the Green Party, and of Fine Gael and Labour supported by the EU, ECB and IMF, have been able to impose, against popular wishes, a host of regressive neo-liberal reforms, strengthening the control capital has here and strengthening the dependence of our economy and state on moneylenders and foreign capital. They have been able to railroad through EU treaties against the voted mandate of the people, and have brazenly broken numerous electoral promises. The democratic structures of the state are openly laughed about, and this is reflected in the general anti-establishment position taken by our class in voting against Fianna Fáil, Fine Gael and the Labour Party or not voting at all. The trade union movement has the potential, is arguably the only movement capable, of pulling progressive forces together in a meaningful way to harness the anti-establishment position of working people and create a positive, energetic movement. To achieve this it must work to realise its potential and right now it is some way off it. We are not part of a movement. Unions are not working to build a movement. Sectionalism and short term servicing remains the priority and so long as this continues, potential will be all we have. Vitalising the movement, organising new workers and mobilising for an independent political programme must go hand in hand. Why an independent political programme? It is time the trade union movement recognised and acted on its unique position. It is the organised working class. 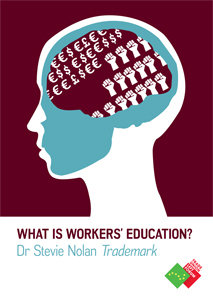 It is 600,000 workers throughout Ireland. It has the members, the resources, the campaigning capacity and ultimately the potential industrial strength to change this country for the better for working people—but only if it can win the hearts and minds of its members to a political programme that addresses the immediate concerns of our class and presents a vision and long-term agenda for transforming fundamentally the structures in this country. This is our cause. Each one of us as a trade union activist must begin to make this demand and to challenge our unions to this cause. The Trade Union Left Forum will provide space for developing the ideas and programme; but fundamentally we, as trade unionists, must bring the demand for an independent political programme into each of our unions. Political parties become stronger or weaker, rise and fall, but the trade union movement has grown and existed for more than a hundred years. We need our own independent political programme and to mobilise our members around it. Parties and Independents who agree with the programme or parts of it can sign up to it and pledge their support. The movement then, not tied to any one party or to a government, is free to campaign and pursue its agenda with its supporters in the Dáil, in the Seanad, and in local councils. The next election is likely to return an even more diverse result in parties and independents. The trade union movement needs to put itself in the strongest position possible to influence politically for our class. This will not be achieved if it is tied, whether formally or informally, to the Labour Party. A break is needed, and the movement needs the ambition and the courage to do this. The Labour Party will be treated like other progressive parties or independents. It will be able to support the union programme, and in return the movement will supports those candidates. But so too will Sinn Féin, independents and other left-wing parties, all on an equal basis. It will be a case of them signing up to our programme in return for our support. Over the next few months the TULF will host a number of workshops, inviting trade union activists and those close to the movement to contribute to the development of an independent political programme for the movement. The TULF will promote the need for this programme and the thinking to be adopted by the movement generally but in the context of an important general election on the horizon. You can be part of this by sharing this article as a start but also by attending these workshops and generally participating in TULF initiatives as the campaign develops.